We arrived just in time to catch the Portland duo Muscle and Marrow. Never really gave their last studio album The Human Cry the time to immerse myself in it, but their live show changed the way I think of them. There are metal elements to what they do, but I would not call them a metal band. Even then, of the three shows, I would say they were the most emotionally heavy band of the week. This was channeled in a very honest physical manner. Singer/ guitarist Kira Clark’s voice goes from an almost black-metal-like scathing scream to a vulnerable soprano. The duo implemented samples and layers of vocals triggered from a laptop off stage, but in comparison to Author & Punisher they were very organic. 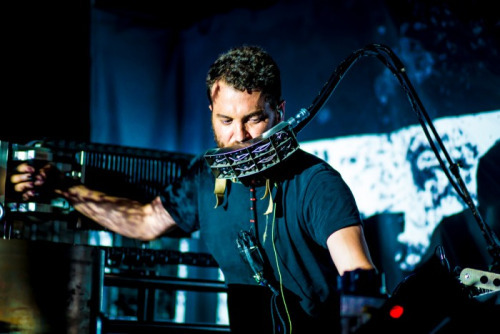 You might be familiar with what machine-wielding Tristan Shone does with Author & Punisher if you have caught a video online, but live it was a much different beast. Shone has toured with metal bands in recent years and the influence is apparent in the harsher and more abrasive attack to his live sound, sometimes creating a droning quality to match the static fuzz of the video screens behind him. One of my friends who went into this show with little to no knowledge of who or what Author & Punisher is said to me that she felt like she was on drugs. This is an apt description as the music engulfed the senses on a vibrational level. Two or three songs in and you realize the fingers of his right hand are playing the cymbals of the drum machine triggered by the hydraulic pump that kept the pulse of the performance. Much like Swans, in the sense it has to be felt live to truly be appreciated, teaching you that something doesn’t have to be color-by-numbers metal in order to be heavy. Two nights later and I’m at The Masquerade seeing Tribulation and Deafheaven. They were playing the 500-capacity lower level of the three-level venue that, funny enough, was having the Insane Clown Posse playing upstairs at the same time. I did not see any Juggalos, but this was in Atlanta, where they can easily blend with some of the trailer trash lurking outside the city limits to remind you Atlanta is still in Georgia. It was unlikely that the openers, Swedish metallers Tribulation, would be mistaken for being down with the clown, despite the smidge of makeup they wear. Their album The Children of the Night has already hit many end-of-the-year lists, and this is not a band who are just riding a wave of hype, based upon how deftly they attack their instruments. Live, the songs to breathe a little more than they do on the albums. At times it feels like they are jamming. This is fine by me; if you want to hear a band sound just like the album, then why leave the house to go look for parking somewhere? This was my third time seeing Deafheaven. The first time I saw them, they were an up-and-coming band supporting their Roads to Judah album. They blew Alcest off the stage of The 529, a small bar with a capacity of about 100. Then on the Sunbather tour they played The Earl where I saw Author & Punisher earlier in the week. 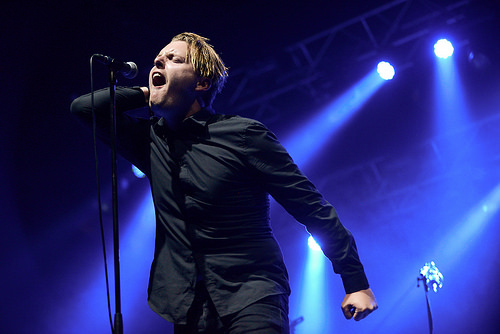 Deafheaven were more intense than the more relaxed vibe of Sunbather might have suggested, but energetically nowhere as aggressive as the first time I saw them. Metalheads, like any good drug addicts, go into shows wanting to have the same feeling we had when we first saw the band. But that is a place in time that has passed; the set at The Masquerade proved there was no going back to that moment in time. 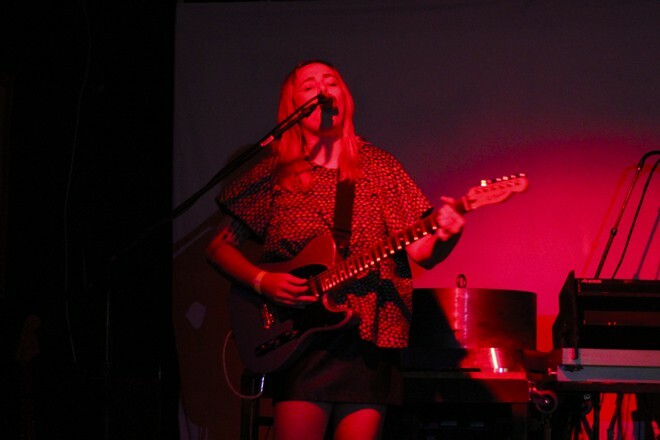 The set was steeped in the band’s two most recent albums with Roads to Judah ignored. Judging from the crowd I might as well have been at a Minus the Bear concert; this gave credence to the line of thought argued on many a forum that the band makes black metal for people who don’t like black metal. We can bicker like children in the lunchroom as to what is black metal or not, but it was still evident that the band believe in what they do and were not dialing it in, so I can appreciate that. 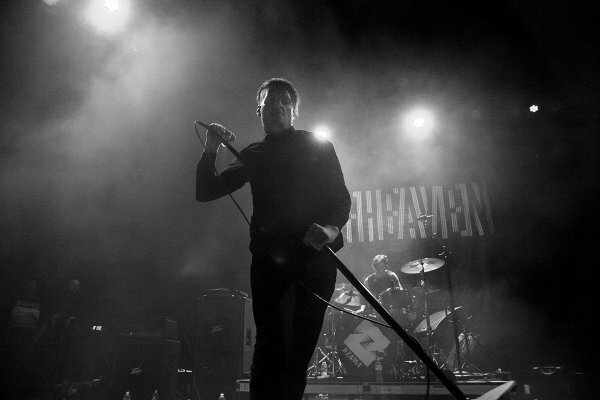 Deafheaven did not seem to be as loud as a metal band should be, due in part to the high ceiling of the concrete box known as the “Hell” section of The Masquerade (used more often than not as a dance club), having seen both Converge and Watain play there and leave my ears ringing. They were more about clarity and less about the power of volume this time around. For their encore they came back and played “Sunbather” and “Dream House”, crowd-pleasers since they served as the entry point into the band for most. I am not surprised by the fact the crowd has grown with each show; the cat was out of the bag with Sunbather. One of the reasons I like New Bermuda is for its added aggression and more metallic edge. The only way this came across was in Clarke’s vocals, which carried more snarl and sometimes dipped into lower growls. His stage presence was not as in-your-face; at times he looked to be waving his hands like a conductor to connect himself to the song’s heartstrings. I am OK with most of the changes the band has undergone, I just want to hear them louder next time. The third show was one of an undeniably metal nature. 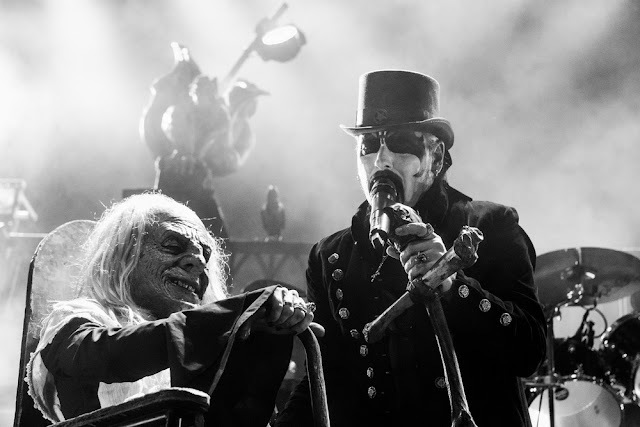 It was the third time I have seen King Diamond in a just over a year’s time. The catch this time was the promise of Abigail being played in its entirety. 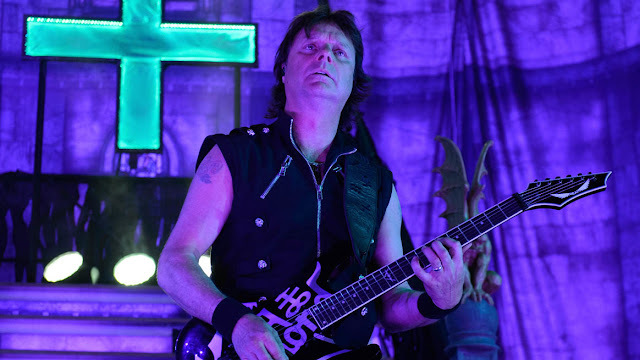 Playing entire albums live is something many bands have been doing over the past few years, but Abigail being my favorite King Diamond album gave this more appeal. The concert was being held at The Tabernacle, an old church that was turned into a House of Blues venue. Metal shows were once held there with a little more frequency. I’ve seen Slayer, Dimmu Borgir, Pantera, and Morbid Angel there. Tonight the show started promptly with Exodus opening. A band plagued with line-up changes, this one included Pleasures of the Flesh singer Steve Souza back in the fold. They were solid enough — aside from “Body Harvest”; when they strayed from the first three albums the songs were a little stiff and one-dimensional. Of course, King had to play other stuff aside from Abigail. He opened up with “Welcome Home”, after first rolling Grandma onstage. They followed it up with “Sleepless Nights”. Then he stopped and said that despite it being a few days late, every day for him was Halloween, and thus they kicked into to the song from Fatal Portrait. This was my seventh time seeing King. Granted, one of those was the mid-’90s Mercyful Fate reunion, so some of what I have and haven’t seen him play has begun to blur together. He churned out “Eye of the Witch” before taking on the Mercyful Fate covers. “Evil” was expected, but “Come to the Sabbath” was replaced by “Melissa”. Then the lights dimmed and the coffin was rolled out for Abigail, with the opening played over the P/A before they galloped into “Arrival’. King’s voice was in fine form, only faltering with a slight flatness to the bridge earlier of “Sleepless Nights”, but it could have been a lapse in his in-ear monitors. By the time “A Mansion in Darkness” was busted out, a procession of drunken rednecks began who tried to weave their way to the front so they could hold their drinks in the air to songs they didn’t know. The actress / dancer who plays Grandma under a mask did an excellent job of acting the story out. The best moment for me was “The Possession”, though the classic riff to “Abigail” never fails. When it came down to pulling off the Abigail album, the pressure was really on drummer Mike Thompson, who had to keep up with original drummer Mikkey Dee’s pinnacle performance. Thompson pulled this off, as well as “Welcome Home”, which has now become part of his wheelhouse. Mike Wead also showed an impressive ability to hang with LaRoque. Their new bassist has been on the road with the band enough to have comfortably settled into his role as well. There were no surprises on “Black Horsemen”, which is now the third time they have closed with this. King Diamond is one of the few performers who could keep me in engrossed in their performance the third time in the span of the year. King is showing little sign of slowing down and just announced a new album in the works for 2016. We can only hope it’s as good as Give Me Your Soul… Please. This was evidence that metal in its purest form and devoid of any hipster trappings is just as powerful now as it was in 1987. 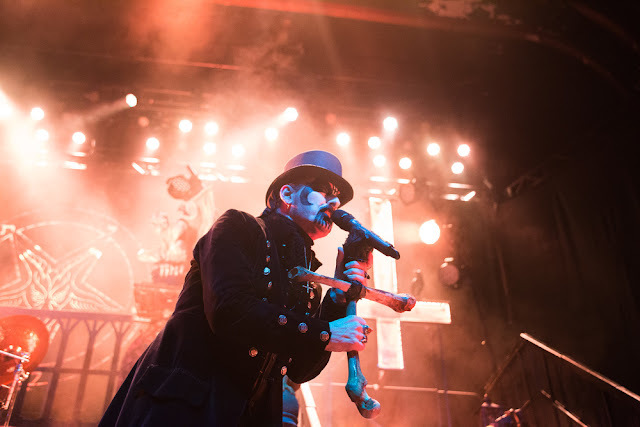 I was at that King Diamond show, flew down from NC specifically for it, and it fulfilled all my wishes. Despite being a KD fan since I was 11, I’ve never had the chance to see them live (34 now). King and the whole band were on point, and the stage set/show was spectacular. Definitely in my top 3 shows, if not my favorite.